My contribution for the Month of People's Photography 2009 was a series of various scenes from around the world containing or implying certain pithy exhortations, forming a mini-manual of 'Epigrams for the 21st Century'. These were inspired by an earlier series of photographs of the ubiquitous tabloid newspaper headlines seen on lampposts and at street corners around Cape Town, which led me to the idea that a photograph could contain its own caption. The photos were framed simply in black file folders under the heading of 'Pictures and Words' (inspired from a set of chinese tiles for children) meant to emphasize the universality of the messages they convey. 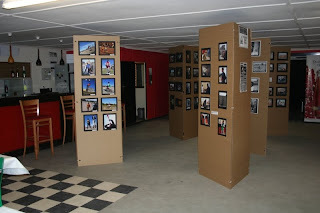 The theme for the 2009 exhibition was 'Maybe Tomorrow'. 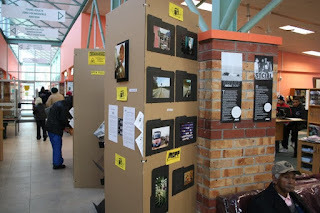 It was a landmark year, one which saw the cafe-circuit exhibitions augmented by a special traveling exhibition that spent one week each at four different venues in the Cape Flats: Gugulethu, Langa, Mitchell's Plain and Grassy Park, thus bringing photography within the reach of all Capetonians and not just residents downtown. This year’s theme, “Maybe Tomorrow” is expected to bring out peoples responses and personal ‘views’ of what tomorrow may bring in this time of change we find ourselves in both here in South Africa and around the Globe. Are you optimistic, skeptical…..even pessimistic about the future ? Photographers are asked to submit images that best describe their thoughts on the possibilities offered by our future, or on the possible futures available to us, in any way they choose to interpret the theme. 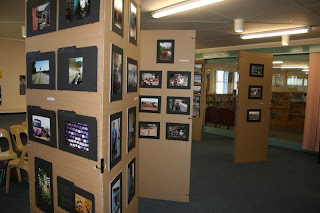 See more images of the exhibition here. Posted by the blind camera at 12:17 a.m.